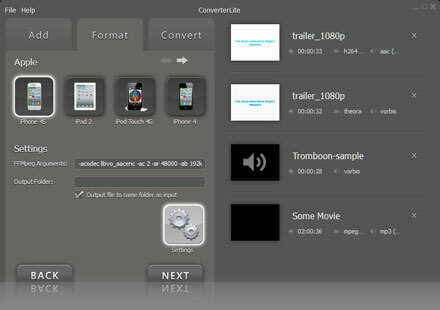 ConverterLite is a free and simple audio and video batch converter utility. You can convert to AVI, mpeg, FLV, MP4, MP3 and more! Convert your audio and video now completely free! Features – what can ConverterLite do? You can convert MP3 files to AC3, MP4, OGG, WAV and WMV. You can also convert mp4 to mp3 and any movie audio to mp3. Convert MPEG to AVI, FLV to AVI, F4V, and Quicktime MOV to AVI. You can also convert from AVI to MPEG or other major formats. 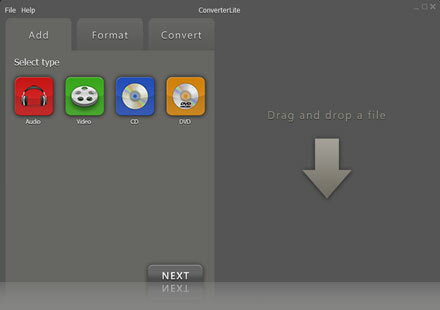 ConverterLite can be used to Burn media to your CD’s/DVD’s. You can also use our simple DVD/CD Ripping feature and convert to any format! Make your audio and video files compatible for your iPhone, iPad, Android smartphone, PSP, PS3, Blackberry and even for burning DVDs. ConverterLite is a simple interface to make converting easy. Simply add your file, choose a format or device and hit convert! Clicking the download button begins your installation ConverterLite. ConverterLite did a great job converting all my mpeg files to avi. I could queue the files and do batch converting. I also converted movies onto my ipad and it worked great! Would recommend ConverterLite for video converting! ConverterLite is simply the best MP3 converter you can get. It does batch jobs, is so simple and very fast. Now I can convert mp3 to mp4 and vice versa. I also use ogg a bit too. ConverterLite version 1.6.10 was published on Tuesday 19th August. ConverterLite version 1.6.9 was published on Friday 13th June. ConverterLite version 1.6.8 was published on Friday 21st February.